"A rich topping for coffee cake! Cream may be substituted for the milk." Melt butter in a small saucepan set over medium heat. In a medium-size bowl, stir flour with sugar. Then whisk into melted butter until mixture is moistened. Stir in milk until smooth. Cook, whisking frequently, until thickened and smooth, about 5 minutes. Stir in brandy and vanilla. Remove from heat. 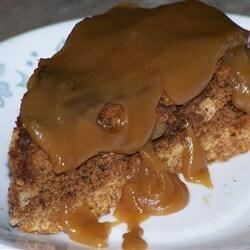 Serve right away over Apple Coffee Cake with Brown Sugar Sauce. Or cover and refrigerate for a week or more. Reheat just before serving. See how to make an incredibly scrumptious red wine steak sauce. This sauce was amazing!! Poured it over hot bread pudding and didnt add the brandy, yummm!! !